Kim Sang-jin's third film is an anarchic blend of gangster, youth, and comedy tropes which features sprawling brawls, which Kim had already perfected with Attack the Gas Station (1999). 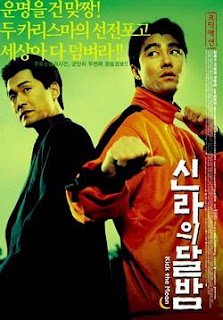 Kick the Moon sports some great comic turns from Cha Seung-won, Kim Hye-soo, and Yu Hae-jin, takes place in a small town, and boldly equates gangs with big corporations. Jang Jin would also do this later in some of his films as his gangsters characters would often refer to working for a company and being businessmen. The film is mostly played for laughs and many of the gang figures are ridiculed but then again so is Cha's teacher, whose youthful fighting skills have now been reappropriated to discipline unruly high schoolers. Et ou est passer the chaser ou the murderer?.Dirty carnival ok, Pour moi c'est a Bettersweet life. For me is completely the movie on the korean gangster genre. That's all about korean gangsters in a not fancy way but a realistic one. Source. i'd seen all the movies of the list and for me this is it!